Perfect add to the decor. I do caution you if you are ordering the taupe. I also ordered the taupe and they messed up the order 3 times, and then cancelled it all together. The grey was just as expected. Like them. Enhance your decor with this stylish modern pouf made of this soft felt. Tip: The handcrafted touch of artisan skill creates variations in color, size and design. If buying two of the same item, slight differences should be expected. Note: Color discrepancies may occur between this product and your computer screen. Great pouf for the price. I searched several stores/websites for a cream knit pouf and finally found this one... It's a great color and size. Perfect to use as an ottoman with the small rocking chair we purchased for our baby's nursery. It is pretty stiff, not a comfortable seat, but holds it's shape if it is used as a seat. My only complaint is the knitting at the top and bottom doesn't come together very closely so you can see a lot of the fabric insert - not a big deal, but makes it look a little less high quality in my opinion. Overall would recommend this product as an ottoman/foot stool. Would look great with any decor. Love these poufs. We use them as ottomans, as chairs for the kids to sit around the coffee table for game playing, and we roll them them around the house (just because it's fun). Oh yeah, we sometimes make a snow man out of them since there hasn't been enough snow outside -- a soccer ball makes a nice head. :) The colors (orange, red and gray) were exactly what I was looking for. They look very nearly as they did on the screen. The orange one really gives a nice pop of color to my living room that has lots of charcoal gray. The material is sturdy. It is a thick cable (almost rope like) that feels like it's going to hold up for the long haul -- we will see. They are a nice size. They don't take up too much room like a normal ottoman would. Since we have three of them, we have noticed that they can be slightly different in their shape, but we think that adds character. Our home decor is pretty simple with a mixture of modern and antique furniture pieces with little clutter so these ottomans brighten things up a bit. They are perfect for our family. It was just what I was hoping for, great product with an awesome price. I got the aqua pouf & the color was spot on. Highly recommend this item. Finally a pouf that doesn't leak! This pouf is for sitting on and for looking cute, NOT for lying on the ground and putting your head on. 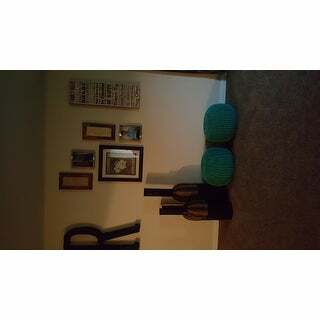 We have had several softer, more pliable poufs and they broke almost immediately. My kids loved them because they would use them for a pillow. 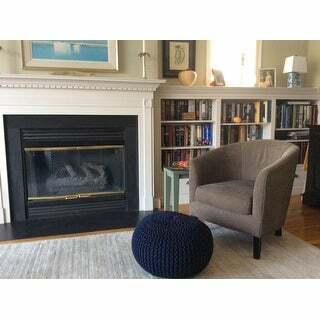 This pouf is perfect in that it completes the design in my basement tv area, provides extra seating and doesn't leak! Love it! Purchased this to replace an oversized ottoman that came with a nursery rocker. This item fit the bill perfectly. It's smaller size and comfortable feel were exactly what we were looking for. I bought this small ottoman for my daughter to add a splash of color to her NYC apartment. The pouf served the purpose. I can say the size is a little small, so it doesn't really serve as ancillary seating. 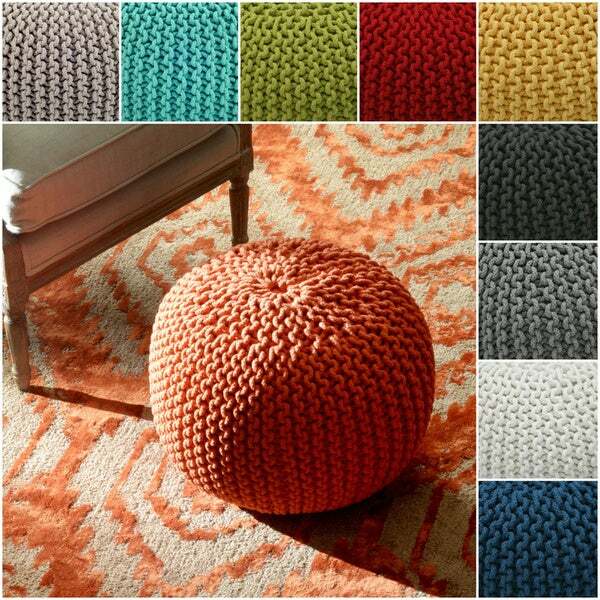 But, if you just want to supplement an accent color this pouf should serve you well. Excellent piece! Good quality, not soft, great color, perfect for resting your feet! Very cute and I love the lime green. It is on the small size so make sure the size is what you are looking for. too small (19x13) too lightweight (check weight before you choose one) but cable material is very durable and color (navy) was true. I wanted a pouf as a smaller foot rest, but this looks small and awkward. I'd rather have it heavy for a furniture feel, but I suppose if you want lightweight, it'd be good. I'll keep it but I'm not crazy about it and would replace it if I found something more suitable. Sloppy construction. I had three issues with this pouf. There's a knot at the top where the cables are cut that you have to tuck in. The whole in the top is so large that the inside fabric sticks out making it look cheap and I couldn't imagine trying to keep the thin white fabric clean or even in good condition. Finally, there's an obvious seam on one side not shown in the picture. Returned it. I LOVE the orange pouf! It is the perfect size to use as an ottoman ... exactly what I was looking for! You can use this as a foot rest or a seat. I bought the orange and it's not too bright. This pouf was very cute I have to admit. The orange color was great. However, it is hard as a rock. There is absolutely no give in the cushion and the cable knitting is also very stiff. I returned it and my back side thanked me. I was looking for something to add color to my living room as well as a comfortable place to put my feet while reading and this Pouf is it. Sturdy and just the right size. Love the pattern and it is light weight so easy to move. Highly recommend. So cute. Goes with my room perfectly. 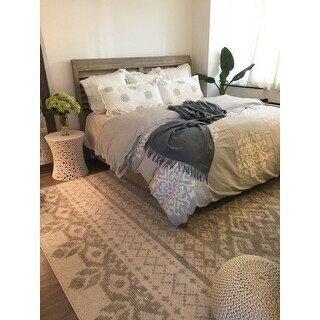 Beautiful the color is exactly as showing on the website but, the only reason I had it on 4 points it because I bought the color because of the Rug I have, but I have to return the rug and I can’t keep the pouf that color, otherwise I would’ve keep it, very nice! Nice and firm. However you can see the lining through the cable knit. Very nice shape and size. Color is a true navy and it appears to be well made with new "outside" view of inside contents like some cheaper poufs that I have seen before. 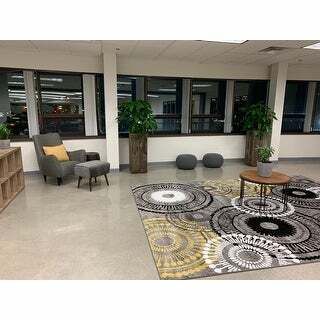 Will use as foot stool or small table for me small living room. "Is the white pouf stark white or off-white?" i'd say bright white. def not an off white. love it. "Is this cover removable for washing? " "Do you have the orange one availble? Patti"
Hello LA mom, we do not currently have the orange in stock, we do get new inventory daily, so please check back soon. Thanks for shopping with us! This is for our new living room in coastal/nautical style. "There is a taupe color pictured. Is this color available? Or will it ever be?" Hello JuliaSki, items are restocked as they become available; however, we cannot guarantee an item will be restocked. Thank you for shopping with us. "How often are the colors restocked, and can we be notified when a color is restocked?" Hello imfields, items are restocked as they become available; however, we cannot guarantee an item will be restocked. Thank you for shopping with us. "is the cover removable and machine Washable?" Hello RJ, this is not removable and it is not machine washable. Thank you for shopping with us! Terri D.